Here's one of Benny's favourite soup dishes. There are many versions of this soup. But this one is my own concoction. Hope you try it some time too. 1. In a large pot, add chicken stock to boil. 2. Add peppercorns, vinegar, dark soya sauce to boil for 15 mins. 4. Add all the vegetables except bean sprouts, egg. 5. Cook for 10 mins on medium heat. 6. Then add the starch mixture. 7. Stir till the soup thickens. 8. Add beaten egg and stir gentlely. 9. Turn off the fire/stove. 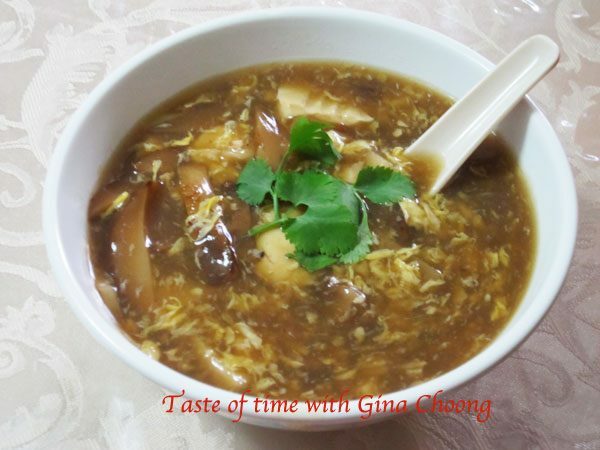 To serve, add a spoon ful of bean sprouts and add boiling hot soup over it, to semi cook the bean sprouts. To garnish, add a pinch of fresh coriander leaves on top. Gina, can I ask you what are pepper corns? If I can't find any in France, can I subsitute it with black pepper or something? peppercorns are seeds of ground pepper before its grounded into white pepper powder, that's peppercorns. the flavour is more instense and less spicy when its cooked whole. when you want it more spicy, you would ground it. Thanks Gina for the prompt reply!! I'll try and find it this wkend at the supermkt!! is this hot and sour soup like the ones we find in those Beijing noodle places (suan la tang)? don't know if its the same thing. But I think its not. the suan la tang is red in colour? Yes, the suan la tang is red in colour but I assume it is because of the chili oil. So this recipe is a little different?